One crafts project later and you've got yourself a VR headset to match! YouTube announced today that it's bringing virtual reality to your smartphone with the latest update to its service. In addition to adding VR-enabled videos, YouTube is also adding the ability to watch regular videos the Cardboard headset, turning any vlog, unboxing, let's-play or John Cena meme into a theatrical experience. 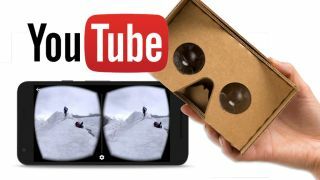 VR-enabled videos on YouTube simply require an Android smartphone, the latest version of the YouTube app, and the build-it-yourself Cardboard viewing peripheral. Once running, videos built for VR are a button press away, complete with a full field of view and an additional sense of depth that YouTube claims "[will] make you feel like you're actually there." The second feature YouTube's updated mobile app allows is the ability to use the same Cardboard setup for all videos, not just ones shot for VR. While it's not the same as being fully encompassed by a virtual environment, Cardboard functionality on normal videos can create a secluded, movie theater-style experience right in front of your face. To get hooked up with the Cardboard viewer, you can order one of several styles online or construct one yourself if you're feeling crafty using information from its homepage. There has yet to be any word on whether VR support will come to iPhone and other non-Android devices, or to other VR devices, like the Oculus Rift. For those having trouble visualizing YouTube's move to VR, a look at videos shot with the company's Jump framework, which allows for 360-degree video, can be viewed on any modern smartphone or computer, giving users a slight sense of what they might be missing out on.